Just about everyone is talking about something "green" these days. Whether it's green cars, green buildings, or just the green focused lifestyle itself, you can hardly turn around without someone pushing some green concept in your face. It's enough to turn a person, well, green. I have always tried to maintain an earth friendly outlook myself. For me, that vision has been absorbed in the lifetime pursuit of trying to plant at least enough trees to offset the trees that have been utilized to serve my needs. Of course, I'll never know for sure if I've accomplished my goal. That's one reason why I haven't stopped planting them yet. That's also the reason why a particular blog post, from WeHeartWorld, piqued my interest. The lively folks at WeHeartWorld, put together a list of ten companies which claim they shall plant at least one tree for each purchase of a specific item, or which facilitate the collection of donations for tree planting purposes. It's an absolutely fantastic effort, and I wish a host of companies would jump on that bandwagon. For instance, the "Plant a Tree for Me" campaign, sponsored by Dell, encourages consumers to make donations for tree planting. The claim is that a $99 donation to the Dell effort could provide a person with a one year carbon offset.I can't validate the assertion that you can offset your carbon footprint with tree planting purchases and cash donations. However, if all these trees are truly being planted, that can't be bad for our home planet. I suggest that consumers may want to research any tree planting strategies which they may wish to support before involving any money. I also heartily suggest that you pursue tree planting efforts of your own, at home. For other interesting strategies regarding free or low cost trees and plants, take a look at my blog post about FreeTreesandPlants.com. The site offers unsold nursery plants at -shipping only- prices! You can also get free trees by starting up a membership with The Arbor Day Foundation. 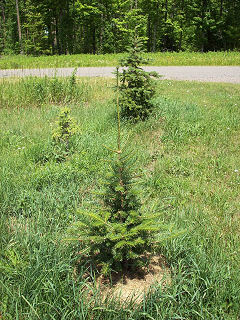 They offer a host of tree propagating options. Trees clean our air and our water. Trees are useful, beautiful, and fully replaceable. If you have a heart for our home planet, and you'd like an effective and inexpensive method of helping her out, roll up your sleeves and help out with the trees. I promise, the good Earth shall thank you for it!